I did my kindergarten to 8th class in Warangal. From 9th class to 12th class, I was in Hyderabad. I did my bachelors in physiotherapy in Bangalore. I did my post graduation in filmmaking from Sydney. I had been in film industry for the past six years. I worked for a film titled Kedi in the past. I used to draw and click pictures. My handwriting is good. I got first prize for handwriting for Rangareddy district inter-school competition during my 10th standard. I was creatively bent right from childhood. The passion for cinema developed as I saw a lot of drama unfolding in the surroundings around me. The moment I entered 2nd year of my graduation, I realised that I can’t be in physio. You need to be very passionate and highly patient to get results in physiotherapy. I was bored. I figured out that I was good at telling stories. I used to entertain friends around with stories. During that period, I joined as an apprentice in Vizag for a film titled Manasu Maata Vinadu. I worked over there for 20 days. I realised that you can’t randomly go there and work for an art form. Later I completed my graduation and went on to study filmmaking in International Film School, Sydney (now known as AFTT - Academy of Film, Theatre & Television). It was a 3 year course. Sydney was a great experience in terms of liberating yourself to write a story and shoot it. People came from all over the world. Exchange of cinema, tribes and culture was there. I came back to India and worked on Kedi to understand nuances. I wanted to meet producers to narrate a story and it was very difficult to even get an appointment. A producer has accepted to produce the film and he backed out. Then I prepared the story of Arjun Reddy. It was rejected by everybody. Some producers dozed off to sleep during the narration. They used to say 2 things. 1. This can’t be your first story. You have to come with a conventional story to convince producers. 2. You are in wrong place and you have to go to Bombay. I feel that it’s one ball. You have to hit either six or four. Defence, One’s and Two’s will not do. It’s as good as getting bowled. You don’t have net practice also. My brother lives in USA. My brother invested half of the budget and my father invested the rest of money. I come from a comfortable family, but not from a very rich background. Looking at my passion, they came into picture. I am happy that I repaid they money now. When I wrote the story, I thought only Allu Arjun could do justice to this script. I narrated this subject first to Allu Arjun five years back and it didn’t work. He liked it, but they can’t trust me as I was a newcomer. Sharwanand was a good choice for the script. Sharwanand loved the subject and sent me to many producers and none of them were ready to produce as they felt that it was risky. They wanted me to go for a smaller actor and reduce budget. The budget of the film will be same except for actor remunerations. When I selected Vijay, the producers wanted me to do finish the movie in 1 crore. There is a lot of travel in the film - Hyderabad, Mangalore, Mussoorie and Italy. When we started shooting for this film, Pelli Choopulu wasn’t released. Lot of people scared me saying I was putting in my brother and my father’s money into huge risk. I used to think we can’t be on roads if film fails. I was confident that I can sell it for at least half of the price. Arjun Reddy is a story about a Tulu girl and a Telugu boy. The girl is a junior and the boy is a house surgeon. There is an age difference of 4 years between them. I needed to show that age different with right casting. I wanted an unconventional face for leads. Shalini comes from Jabalpur theatre background. Vijay also comes from theatre background. Both of them have an artistic level of understanding. I did an acting workshop for 10 days. I was happy. If anything goes wrong, I am responsible because I have got the right actors. I was very conscious of not taking cinematic advantage while writing the script. When there are twists and turns in our films (big or small), they easily jump. I didn’t jump. I was stuck for 3 or 4 weeks by not getting idea and grilled to get a solution. The film is about a boy falling in love with a girl. They depart and they meet back. It sounds very normal in an oneliner. But the treatment is very tangible. Without any jinx I can say that after Sakhi, you will see real characters and real love between those characters in Arjun Reddy. Making audience believe is the key to success. 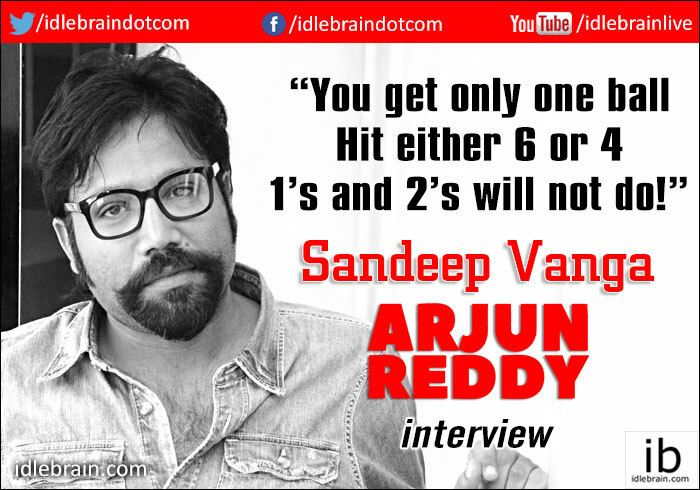 Arjun Reddy character has anger issues and is very aggressive. When you write a script, you think about a particular location. But, it scared me when we got worst of locations for some of the scenes. But it didn’t matter because our attention would be on characters. I realised that when content is clear, locations doesn’t matter most of the times. They used to say in film school that if you are able to say cut, then you are a director. I have personally edited teaser and trailer. I was also involved in sound design deeply right from the beginning. I got Sachin Hariharan from Sync cinema. They have done a fantastic work. There is a 6-minutes scene in the film where characters keep talking and camera is just breathing on them. There is no background score. It is only the ambiance. When I released the teaser, so many people came forward quoting prices like 7 crores and 8 crores. I didn’t want to sell the film midway because if I sell the film, I might not have control over quality and time frame. When we completed the film and wanted to sell, the price has come down to half. They were citing Vijay’s last release Dwaraka as the reason. Nobody knew the market price for Vijay film after Pelli Choopulu release because producers didn’t sell Dwaraka film. Finally I sold it to Asian films and KFC Cinema for a reasonable price. Though I would love to exploit the full potential, I was cautious to cover the making costs so that I can repay money to my brother and father. Some people said that nobody will buy satellite rights because of A certificate. If no TV channel wants to buy Arjun Reddy, I am confident that I will sell digital rights to internet companies at much higher price. It doesn’t matter. When you see a commercial film, the format is same for Telugu cinema. Mother and father characters are the same. Dubbing artists are the same. When you go in that conventional format, you need to stick to 2 hours to 2 hours 20 minutes runtime. My scenes are fresh and my film is unconventional. If the film is new, people will not concentrate on runtime. Telugu audiences have proved it. When I was a kid, I saw a film called Hrudayam (Idhayam in Tamil). It ran for 100 days in Warangal. Hero was a dark and average looking guy. There were no dialogues between hero and heroine. By the end of the film, heroine falls for him. It was an overwhelming response. I did the right job that is required for the film. I am happy. I had a valid reason why hero takes drugs. I convinced the censor board members. They didn’t touch the drugs aspect in the movie. They didn’t censor kisses (liplock) in the film. I have convinced them that it’s just an artistic expression and there is no vulgarity in it. They zoom camera on private parts of women in most commercial films. If a kid asks me about kiss in my film I can say him that after he becomes an adult and fall in love, he will understand. I have no explanation to kids for the tacky zooming shots on private parts of women in a movie. I feel that such films deserve an A, not a film like mine where there is a kiss. They had cut audio for cuss words like ma*******d, b*****d, f**k etc. I thought they hear to me properly if I resonate well. But, it didn’t happen. I think they saw the film with preconceived notion. I was expecting U/A. A word like ‘Subhavartha’ was wrongly spelled as ‘Suvartha’ by the person who translated the script. I had to dub it again to satisfy them. There is word ‘Telangana’ in one of the conversations. They felt that Telangana people will feed bad. I told them that I am a thick Telangana guy and I haven’t felt bad. Hyderabad is a growing cosmopolitan city. Censor were very adamant about it. Censor people have also asked me why I didn’t censor teaser before putting it on TV. I told them that I released my teaser on YouTube where censoring is not required. It has logged over 10 million views. Out of their own interest, TV people have broadcasted it. I asked them to approach TV channels and ask them why. My trailer duration is 3 minutes and 15 seconds. Lot of people said that nobody will see if its lengthy. I released it on youtube and it generated 8 and half million views so far. My trailer was not shown in theaters as there is a restriction of 2 minutes duration for trailers to be shown in theaters. I dropped the idea of sending theatrical trailer to theaters as it saves money as well. I have cut 10 seconds and 30 second trailers for TV medium. ‘Ee Nagaraniki emaindi’ ad in theaters was making sense. But Rahul Dravid’s anti smoke ad which says ‘nee amma nannala tappidam valla nuvvu runout avadam’ doesn’t make sense. These ads are taking 5 minutes of movie running time. Interval anti-smoke ads kill the feel of the film. Films have become a soft target. Raj Thota is the DoP and he did 85% of the film. Initial schedule was done by another guy. I didn’t like his work and got him replaced by Raj Thota. Arjun and Reddy have five letters each in English. It looks aesthetically good in English than in Telugu. Black, White and Red is a terrific combination for a poster. It was a deliberate idea to have title cover 30-40% of the poster. It also represents the boldness of Arjun Reddy character. But distributors wanted Telugu logo for C centers. I told them that Arjun Reddy is not targeted at people who can’t read Arjun Reddy in English. But we had to give in as they have every right for it. Telugu logo posters can be seen in C centers. There are seven songs in the film that go with mood, They are like scenes. There is no cut to song at all. There is no introduction song. Other than break-up song, all songs have soothing music. I learnt in film school that unless there is a reason, you shouldn’t even pan the camera. 65% of classroom scene from the film is shown in the trailer. That scene is something radical. He can use his senior power in a regular way. Then I got this idea and it worked. The teaser represents the character of Arjun Reddy and trailer represents the crux of the film. You have seen the finished product now. Are you satisfied? Arjun Reddy is a love story. What are the love stories you personally like? Revolutionary Road, Rockstar, Tamasha, 7/G Brindavan Colony etc. Requiem for Dream is a deep intense love story in a way though both are addicts. Leaving Las Vegas is a strong love story. Roja is a love story, but most of the people look at it as a terrorist backdrop film. My brother showed Arjun Reddy to a group of 35 people in USA. Only 3 people complained about length of second half. I got an unanimous response from rest of the audiences that it will be a pathbreaking film. There were women and girls in that group. They never felt anything objectionable in the film. It’s distributor’s idea. I wanted good talk to be generated as people will go rave about the film. A good talk in premieres generate terrific openings on Friday. I have good script. I want to narrate it to Allu Arjun. I want to meet NTR also. I also have a few other scripts that suit new faces.